Analysis of CQC inspection data between January 2018 and January 2019 found care homes got worse in 37% of local authorities. 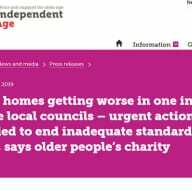 George McNamara, Director of Policy and Influencing at Independent Age, said: “These findings are truly alarming, and show thousands of vulnerable older people live in homes that are failing to deliver even the bare minimum. By region, 44% of Manchester’s care homes were rated ‘inadequate’ or ‘requires improvement’. There were 16 local authority areas where between 30% and 40% of care homes were inadequate or requires improvement. Mr McNamara added: “Essentially, the Government continues to stand by and do nothing to address the quality of care suffered by older people, many of whom live with conditions such as dementia, and who are being robbed of their ability to enjoy life as much as possible. Labour’s Shadow Minister for Social Care Barbara Keeley said: “Families need reassurance that vulnerable relatives will be getting the best quality care, but all over the country care homes are failing to provide good quality care – and Tory cuts are to blame. “Social care is teetering on the edge of a cliff after nine years of Tory cuts to social care. If ministers don’t act now, things will get much worse. A Department of Health and Social Care spokesperson said: “We are committed to ensuring adult social care in England is high quality, safe and compassionate, and 83% of providers are rated as good or outstanding by the Care Quality Commission. To protect the public and hold providers to account we set up the CQC and invested it with enforcement powers to crack down on poor care or abuse. The post Care homes worse in one in three councils, research finds appeared first on Care Home Professional.